People fight hard to get a film made, non more than an independent production crew on their first project. Directs and acts, does the special effects, camera and electrics and edits, first timer Chris Greene (Alex Riley) does a sterling job of Louie Pizzle‘s story. Ramel Carter is a fast paced action short that has plenty of Martial Arts and gun play that is well choreographed and delivered. A story of a man with honour to keep a secret that he was entrusted with and what some unscrupulous people will do to get their hands on said secret. 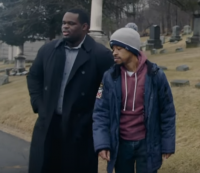 Ramel Carter (Pizzle) and his long time friend Elliot (Jelani Jeffries) are leaving the funeral of his old employer who had been working on a secret formula. They are approached by a man in a suit Alex Riley (Chris Greene) who claims to have known Carter’s ex-employer, he wants to offer Carter a lot of money for the formula entrusted to him. But he isn’t interested. 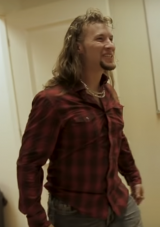 Elliot tells Carter that maybe he should leave the country, so he heads home to his wife Samantha (Cienna Jade) who has been lying in wait for him to return home. He mentions that perhaps it is time to have the holiday that they have been wanting to take. Alex is still on Carter’s trail and when he is sure Samantha is alone he kidnaps her and leaves one of his henchmen Mike (Lionel Sylvestre) to explain things to Carter. He is given just five hours to get the formula to Riley and save his beloved. Carter is not a man to take things lying down so he takes the fight to them, but first visits Elliot to find out about Riley and his men. Along the way he will encounter Seth (Spencer Du Boff), Chris (Darren Holmquist, Paying Mr. McGetty) and Aaron (Justin Parker). 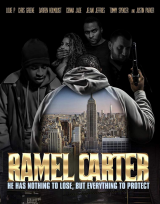 Ramel Carter is a fast paced action short that shows that you can get it right first time and we at RRR look forward to seeing more from these independent film makers, hopefully a sequel to this short.